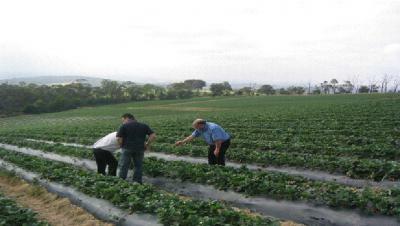 Australian Strawberry Distributors are one of the biggest growers and distributors of strawberries supplying such chain stores as Woolworths, Coles Myer and alike. Our clients at ADS demand the best quality strawberries that Australia can produce and we pride ourselves as being one of the best. Having the need to keep an edge on technology for strawberry farming we decided to try one of Omni's magnetic water treatment systems on one section of the farm where we always had some problem with salty water and poor quality soils. Within the first weeks of installing Omni's magnetic water system it was visible that the treated water had made a great change to the quality and uniformity in size of strawberries in that section. The color was superior, the taste was really sweet and better than the strawberries we were growing on our best part of the land and the yields were much higher. Based on the evidence we saw on the worse section of our farm we decided to purchase the systems and put them on every water pump station. Our results have been excellent, our production has increased, the quality has improved beyond our imagination and we are saving at least 20% water if not more. Hence, we decided to call a meeting of all our growers in QLD and ask Omni to come to share the good news about Omni's water solution for water saving water and improving the entire farming process. Today all our growers are happy to be using magnetic water treatment systems manufactured by Omni. We recommend Omni Environmental Group as an ethical company to deal with and strongly suggest to all irrigators to implement their water technology.